The Great Navigator's bi-hemispheral boyhood home. Episode: 34. Site Numbers: 092 & 143. Date Posted: 18 January 1997. Update 12 March 2000. Location: Great Ayton, Yorkshire, England and Melbourne, Vic., Australia. Type: Building. 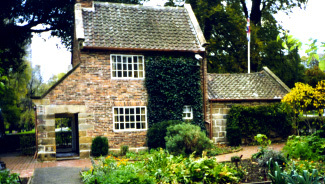 Although Captain James Cook was born in Marton, Yorkshire (1728), his early years were lived, six miles away, at Aireyholme Farm just outside the village of Great Ayton. At 16 he left for employment in the nearby coastal town of Staithes and later apprenticed to a shipowner in Whitby; from there he went on to become the greatest navigator of them all, not the least of his many achievements being the first to cross the Antarctic Circle (January 17, 1773) and the first to circumnavigate the continent at high latitudes. His family remained at Aireyholme Farm until 1755 when they moved into Great Ayton. The farm remains today but not the farmhouse cottage. That was dismantled in 1934, shipped to Australia and re-erected in Melbourne's Fitzroy Gardens where it may be seen today. Yorkshire is rife with Cook sites including museums, historic buildings and public art. The Captain Cook Tourism Association issued in 1994 a marvelous and beautifully produced booklet entitled Captain Cook Country Tour, featuring a self-guided motoring tour. It's worth looking for (ISBN 0 907480 51 9). Update 12 March 2000: My thanks to Francie Gunther for taking many photographs of the cottage, one of which appears here.